My love affair with Chicago began the moment I first arrived. The city impressed me with some of the best restaurants, cleanest streets and nicest people I have ever met (not to mention the hottest guys). For some of these reasons (especially the latter), Chicago is one of my favorite cities in the world and close friends know that I want to eventually call this place home. There is just way too much to do in Chicago to be covered in only one post, but here’s a list of the most popular attractions and my favorite tourist traps (keep a look out for a future post on all the hidden gems). Even though I’m completely afraid of heights, I couldn’t pass on the opportunity to walk in a glass box hanging out of the Skydeck on the Sears Tower. It’s the tallest building in the western hemisphere that stands at 1,353 feet in the air. It also boasts great panoramic views of Chicago. The John Hancock Observatory is an iconic architectural building with a solid steel foundation and captivating views of four states. What many visitors don’t know that I learned the second time I came to visit Chicago is that if you want to forgo paying $20 to get to the Observatory, you can dine at the Signature Room at the 95th and use that money towards a drink instead! Some of you may know that I’m obsessed with the architecture that Frank Gehry produces, including my favorite building in NYC: the IAC Building. The BP Bridge is a 925-foot-long winding bridge brushed in stainless steel panels and connects Millennium Park to Daley Bicentennial Plaza. 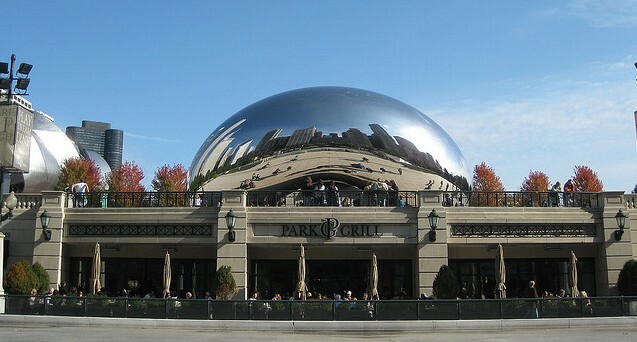 Cloud Gate is a 110-ton elliptical sculpture with highly polished stainless steel plates that reflect the city’s famous skyline and clouds above. A 12-foot-high arch provides a “gate” to the concave chamber beneath the sculpture where visitors can walk inside and see their reflection from a variety of perspectives. The fountain consists of two 50-foot glass block towers at each end of a shallow reflecting pool that project video images from a broad social spectrum of Chicago citizens. The collection of faces is a tribute to Chicagoans that was taken from a cross-section of 1,000 residents. Frank Gehry also created this revolutionary outdoor concert venue. It boasts stainless steel ribbons that frame the stage and is equipped with a state-of-the-art sound system, the first of its kind in the country, that was designed to mimic the acoustics of an indoor concert hall by distributing enhanced sound equally over both the fixed seats and the lawn. The Millennium Monument lies within Wrigley Square and has a semi-circular row of Doric-style columns that rise nearly 40 feet that is meant to the past to the present. Located in south end of Grant Park you’ll find 106 headless and armless iron sculptures. Some locals hate it; some love it. What do you think? Michigan Avenue, aka the Magnificent Mile, can almost be compared to New York City’s Fifth Avenue and has all the major shops, restaurants and events. While there, you can walk inside the Old Water Tower, take some pictures of the famous Wrigley Building, and maybe even stop by the beautiful Fourth Presbyterian Church. The Navy Pier has 50 acres of parks, promenades, gardens, shops, restaurants and attractions. There’s always something going on here and is great any time of the day, whether for a simple run in the morning or eating out at night. After a long day of touring Chicago, I would highly recommend heading over to Gino’s East for a gluttonous pizza dish. I love my New York City pizza and there’s nowhere that could compete with it, but Chicago knows how to hold their own with this deep dish pizza. I’m getting hungry just thinking about it. Visit my Flickr photostream to view more photos of Chicago.